Inserting and removing your Contex lenses is easy. After a few tries, you should easily be able to insert and remove your lenses. Here are a few suggestions to help. 1. Remove the lens from the lens case. 2. Rinse the lens with solution (do not rinse with tap water before inserting the lens). 3. Inspect the lens to be sure that it is moist, clean, clear, and free of chips and cracks. 4. 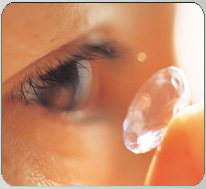 Rub several drops of GP contact lens solution over the lens surface. 6. With the middle finger of the same hand, pull down the lower lid. 7. With the index or middle finger of the other hand, lift the upper lid. Place the lens on your eye. It's not necessary to press the lens against the eye. 8. Gently release the lids and blink. The lens should center itself automatically. Check your vision to be sure that the lens is in the proper position. Use the same technique or reverse the hands to insert the other lens. The lens may not be centered on your eye. There may be debris on your lens in which case you should remove the lens, clean, rinse, and disinfect it. Then re-insert it. Your lens may be in the wrong eye. If your vision is still blurred, remove your lens and contact your eye care professional. Your lens may occasionally slide onto the white part of your eye. This is most likely to occur during lens insertion and removal. To center your lens, follow one of the procedures below. Close your eyelid and gently massage the lens into place through closed lids. Gently push the off-centered lens onto the cornea while the eye is open by pressing your finger on the upper or lower lid next to the edge of the lens. If your lens is still not centered, remove it and re-insert. 1. Cover the counter area where the lens is to be removed with a clean towel. Lean over the counter until you are looking down at the surface. 2. Place your index finger where the upper and lower lids meet close to your temple. Stretch the skin outward and slightly upward while keeping your eye open wide making sure not to allow your lid to slide over your lens. 3. Blink quick and firm. The lens will be pinched by the pressure of your eyelids and will pop out onto the clean towel, or you can catch the lens in your hand as it falls. 2. Place the tip of the index finger of one hand on the middle of the edge of the upper lid and the index finger of the other hand on the middle of the edge of the lower lid. 3. Press the lids inward and then together. The lens should be wedged out of your eye and will fall onto the towel or in your hand. 4. The lens may slide onto the white part of your eye. If this occurs, re-center the lens before trying to remove your lens again. These tips can help you, but always follow the advice of your eye care professional.